Having spent most of the day listening to the cricket, I came home with a punnet of strawberries in tow. England are actually doing rather well against Australia (I've gone and jinxed it now) and I felt the need to fly the flag a little. See, it's a very odd thing when the English do well at sport, we aren't used to it. So not wanting to get too over enthusiastic and then see all my hopes for the remainder of the game (another 3/4 days to go yet) turn to ashes, (see what I did there) I didn't want to get too English about things. I soaked the strawberries in balsamic vinegar for an hour before chorfing them down. Just in case like. Oh, and the weather was positively tropical today, strange days indeed. Sorry, but it is "go Australia." and it's very much "Go England!" I would normally have to side with Barbara on this one and barrack for the Aussies. 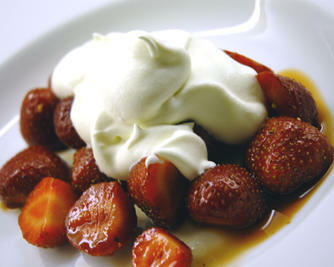 But the strawberries and balsamic vinegar combo have my allegiance on this occasion.